Antwerp (, Dutch: Antwerpen [ˈɑntʋɛrpə(n)], French: Anvers [ɑ̃vɛʁ(s)]) is a Flemish city in Belgium, the capital of Antwerp province in the community of Flanders. With a population of 510,610, it is the most populous city proper in Belgium. Its metropolitan area houses around 1,200,000 people, which is second behind Brussels. 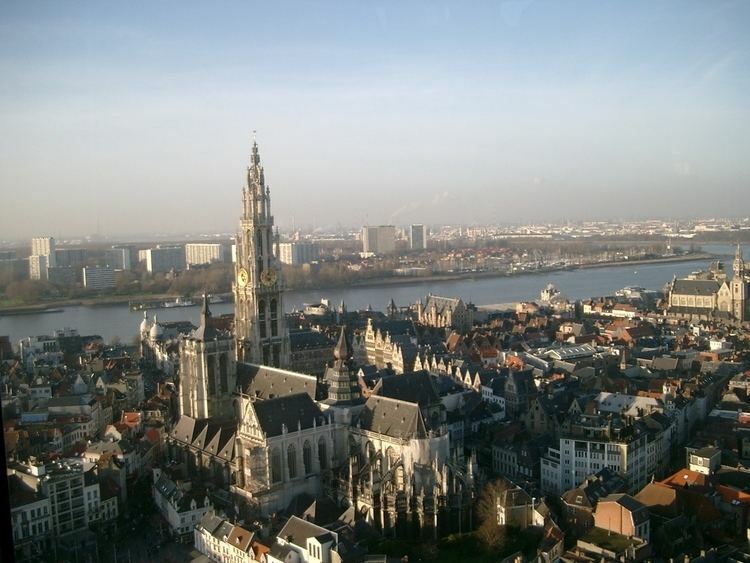 Antwerp is on the River Scheldt, linked to the North Sea by the Westerschelde estuary. It is about 40 kilometres (25 mi) north from Brussels, and about 15 kilometres (9 mi) from the Dutch border. The Port of Antwerp is one of the biggest in the world, ranking second in Europe and within the top 20 globally. Antwerp was also the place of the world's oldest stock exchange building, originally built in 1531 and re-built in 1872, it has been derelict since 1997. Antwerp has long been an important city in the Low Countries, both economically and culturally, especially before the Spanish Fury (1576) in the Dutch Revolt. The inhabitants of Antwerp are nicknamed Sinjoren, after the Spanish honorific señor or French seigneur, "lord", referring to the Spanish noblemen who ruled the city in the 17th century. Today Antwerp is a major trade and cultural centre, and is the world's second most multi-cultural city (after Amsterdam) home to 170 nationalities. It is also known as the "diamond capital" of the world for its large diamond district. The city hosted the 1920 Summer Olympics. Alfred Michiels has suggested that derivations based on hand werpen, Antverpia, "on the wharf", or "at the warp” lack historical backing in the form of recorded past spellings of the placename. 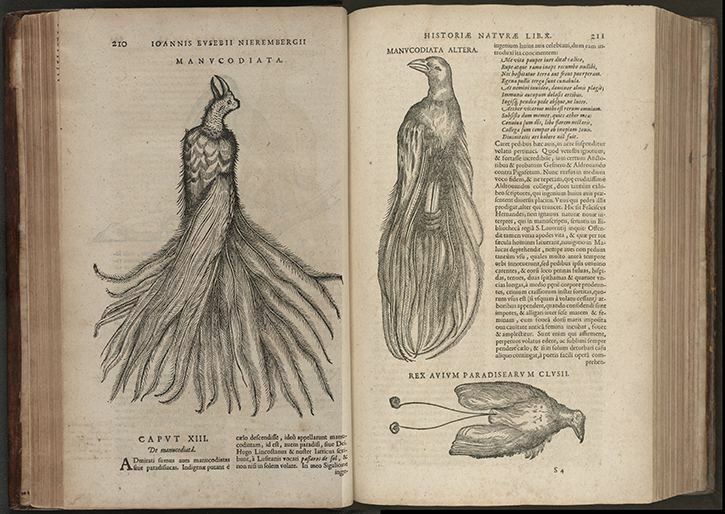 He points instead to Dado’s Life of St. Eligius (Vita Eligii) from the 7th century, which records the form Andoverpis. He sees in it a Celtic origin indicating “those who live on both banks”. In the 11th century Godfrey of Bouillon was for some years known as the marquis of Antwerp. In the 12th century, Norbert of Xanten established a community of his Premonstratensian canons at St. Michael's Abbey at Caloes. Antwerp was also the headquarters of Edward III during his early negotiations with Jacob van Artevelde, and his son Lionel, the Duke of Clarence, was born there in 1338. After the silting-up of the Zwin and the consequent decline of Bruges, the city of Antwerp, then part of the Duchy of Brabant, grew in importance. 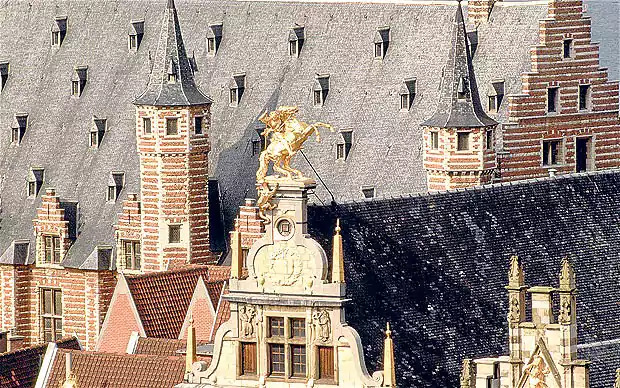 At the end of the 15th century the foreign trading houses were transferred from Bruges to Antwerp, and the building assigned to the English nation is specifically mentioned in 1510. Antwerp became the sugar capital of Europe, importing the raw commodity from Portuguese and Spanish plantations. The city attracted Italian and German sugar refiners by 1550, and shipped their refined product to Germany, especially Cologne. Moneylenders and financiers developed a large business lending money all over Europe including the English government in 1544–1574. Important families, with immense wealth resided in the city amongst them the houses of Schetz, Ursel and Rockox. London bankers were too small to operate on that scale, and Antwerp had a highly efficient bourse that itself attracted rich bankers from around Europe. After the 1570s the city's banking business declined: England ended its borrowing in Antwerp in 1574. Fernand Braudel states that Antwerp became "the centre of the entire international economy, something Bruges had never been even at its height." Antwerp was the richest city in Europe at this time. Antwerp's golden age is tightly linked to the "Age of Exploration". During the first half of the 16th century Antwerp grew to become the second-largest European city north of the Alps. Many foreign merchants were resident in the city. Francesco Guicciardini, the Venetian envoy, stated that hundreds of ships would pass in a day, and 2,000 carts entered the city each week. Portuguese ships laden with pepper and cinnamon would unload their cargo. According to Luc-Normand Tellier "It is estimated that the port of Antwerp was earning the Spanish crown seven times more revenues than the Americas." Antwerp experienced three booms during its golden age: the first based on the pepper market, a second launched by American silver coming from Seville (ending with the bankruptcy of Spain in 1557), and a third boom, after the stabilising Treaty of Cateau-Cambresis in 1559, based on the textiles industry. At the beginning of the 16th century Antwerp accounted for 40% of world trade. The boom-and-bust cycles and inflationary cost-of-living squeezed less-skilled workers. In the century after 1541, however, the city's economy and population declined dramatically, while rival Amsterdam experienced massive growth. In 1958 in preparation of the 10-year development plan for the Port of Antwerp, the municipalities of Berendrecht-Zandvliet-Lillo were integrated into the city territory and lost their administrative independence. During the 1983 merger of municipalities, conducted by the Belgian government as an administrative simplification, the municipalities of Berchem, Borgerhout, Deurne, Ekeren, Hoboken, Merksem and Wilrijk were merged into the city. At that time the city was also divided into the districts mentioned above. Simultaneously, districts received an appointed district council; later district councils became elected bodies. Antwerp City Hall dates from 1565, and is a Belfry in Renaissance style. St. James' Church, is more ornate than the cathedral. It contains lots of famous noble burials, amongst them a major part of the family of Rubens. In 2010, 36 to 39% of the inhabitants of Antwerp had a migrant background. A study projects that in 2020, 55% of the population will be of migrant background. After the Holocaust and the destruction of its many semi-assimilated Jews, Antwerp became a major centre for Orthodox Jews. At present, about 15,000 Haredi Jews, many of them Hasidic, live in Antwerp. The city has three official Jewish Congregations: Shomrei Hadass, headed by Rabbi Dovid Moishe Lieberman, Machsike Hadass, headed by Rabbi Sekkel Pollack of Brussels (formerly by Chief Rabbi Chaim Kreiswirth) and the Portuguese Community Ben Moshe. Antwerp has an extensive network of synagogues, shops, schools and organizations. Significant Hasidic movements in Antwerp include Pshevorsk, based in Antwerp, as well as branches of Satmar, Belz, Bobov, Ger, Skver, Klausenburg and several others. Rabbi Chaim Kreiswirth, chief rabbi of the Machsike Hadas community, who died in 2003, was arguably one of the better known personalities to have been based in Antwerp. An attempt to have a street named after him has received the support of the Town Hall and is in the process of being implemented. The Jains in Belgium are estimated to be around about 1,500 people. The majority live in Antwerp, mostly involved in the very lucrative diamond business. Belgian Indian Jains control two-thirds of the rough diamonds trade and supplied India with roughly 36% of their rough diamonds. A major temple, with a cultural centre, has been built in Antwerp (Wilrijk). Their spiritual leader, Ramesh Mehta, is a full-fledged member of the Belgian Council of Religious Leaders, put up on 17 December 2009. Antwerp's other great mainstay is the diamond trade that takes place largely within the diamond district. 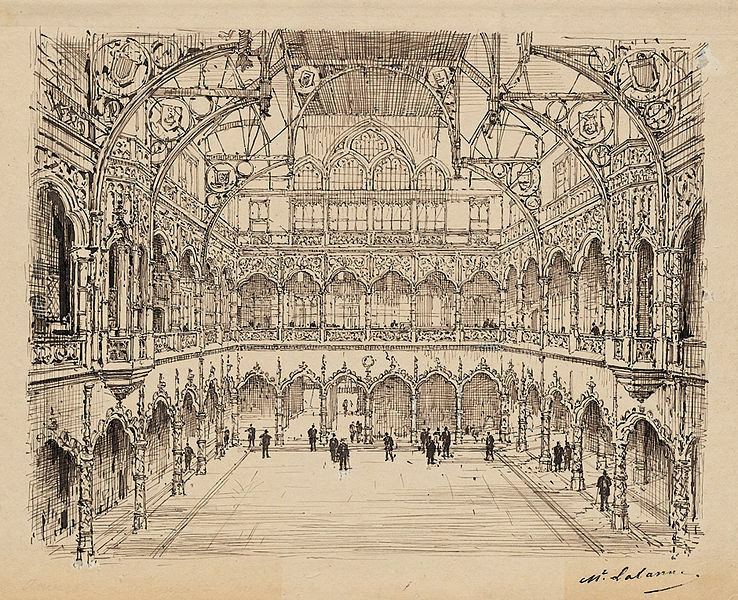 The city has four diamond bourses: the Diamond Club of Antwerp, the Beurs voor Diamanthandel, the Antwerpsche Diamantkring and the Vrije Diamanthandel. Since World War II families of the large Hasidic Jewish community have dominated Antwerp's diamond trading industry, although the last two decades have seen Indian and Maronite Christian from Lebanon and Armenian, traders become increasingly important. Antwerp World Diamond Centre, the successor to the Hoge Raad voor Diamant, plays an important role in setting standards, regulating professional ethics, training and promoting the interests of Antwerp as the capital of the diamond industry. Belgium's major international airport, Brussels Airport is about 45 kilometres (28 miles) from the city of Antwerp, and connects the city worldwide. It is connected to the city centre by bus, and also by train. The new Diabolo rail connection provides a direct fast train connection between Antwerp and Brussels Airport as of the summer of 2012. There is also a direct rail service between Antwerp (calling at Central and Berchem stations) and Charleroi South station, with a connecting buslink to Brussels South Charleroi Airport, which runs twice every hour (on working days). The current city council was elected in the October 2012 elections. The next elections are scheduled for October 2018. In the 16th and 17th century important mayors include Willem Draeck, Lord of Merksem, Philips of Marnix, Lord of Saint-Aldegonde, Anthony van Stralen, Lord of Merksem, Lancelot II of Ursel, Alexander Goubau and Nicolaas II Rockox. In the early years after Belgian independence, Antwerp was governed by Catholic-Unionist mayors. Between 1848 and 1921, all mayors were from the Liberal Party (except for the so-called Meeting-intermezzo between 1863 and 1872). Between 1921 and 1932, the city had a Catholic mayor again: Frans Van Cauwelaert. From 1932 onwards (and up till 2013) all mayors belonged to the Social Democrat party: Camille Huysmans, Lode Craeybeckx, Frans Detiège and Mathilde Schroyens, and after the municipality fusion: Bob Cools, Leona Detiège en Patrick Janssens. Since 2013 the mayor is the Flemish nationalist Bart De Wever, belonging to the Flemish separatist party N-VA (New Flemish Alliance). Royal Antwerp F.C., currently playing in the Belgian First Division, were founded in 1880 and is known as 'The Great Old' for being the first club registered to the Royal Belgian Football Association in 1895. Since 1998, the club has taken Manchester United players on loan in an official partnership. Another club in the city was Beerschot VAC, founded in 1899 by former Royal Antwerp players. They played at the Olympisch Stadion, the main venue of the 1920 Olympics. Nowadays FCO Beerschot-Wilrijk plays at the Olympisch Stadion in Belgian Third Division.